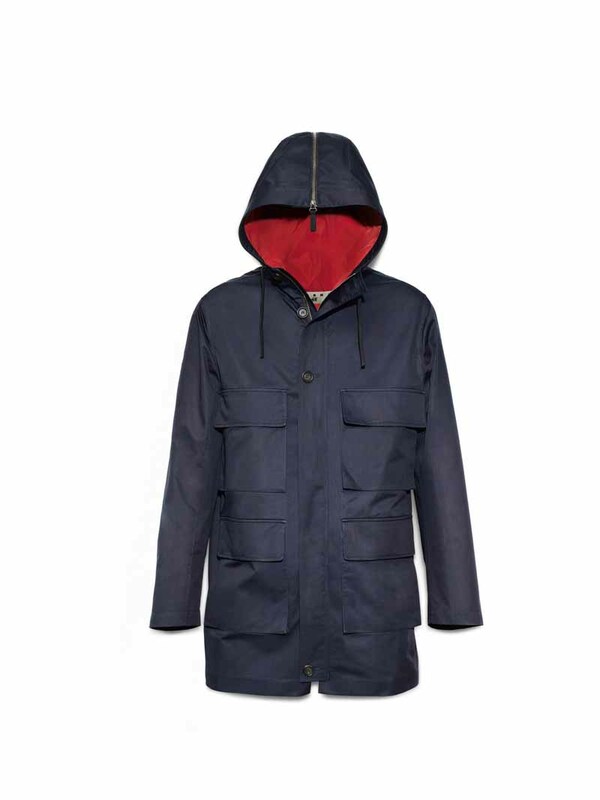 Parkas are slim and playfully utilitarian; formal suits come either with long pants or Bermuda shorts. Plays of intarsia and prints gives new meaning to wardrobe staples such as shirts and knits and Marni’s striped men’s sweaters come in luxurious cashmere. Pops of color on a sleeve, or in the lining add a dash of the unexpected, while matching shirts and shorts have a sense of loungewear. A hint of workwear recurs throughout as well. The color palette is pragmatic, with unexpected ruptures. In the women’s collection, notes of black, dark gray, navy blue, olive fatigue green and khaki are interspersed with flashes of rust, orange and gold. For men, black, deep blue and khaki are accented with peaks of light or electric blue, orange and crimson red. Allover prints add visual richness: there are geometric motifs for both men and women, and in the womenswear, abstractly naturalistic patterns. Fabrics have a firm hand or a degree of fluidity: crisp cotton, taffetas, and silk, along with patent or matte leather and metallic lamé are used in the women’s collection, while compact cotton in different weights dominates the menswear.